It's time to start planning your Mother's Day gifts. What better gift than a special Mother's Day serenade! We're taking orders NOW so go ahead and get yours scheduled! Honor your favorite ladies with this special recognition. Place your order on the Mother's Day Serenades page or print out the attached order form and send it in. On either May 11 (Saturday) or May 12 (Sunday) between 10 AM & 7 PM, a Sweet Adeline Quartet from the Greater Richmond Chorus will deliver your special gift! We offer in-person serenades or phone serenades for your out-of-town ladies! See the booking details and options on the Serenades page. 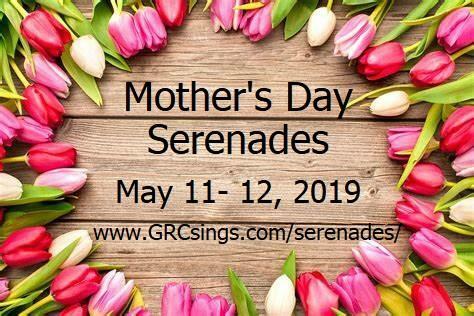 For in-person serenades, a GRC quartet will visit that special lady in your life and sing two, unique Mother’s Day songs, deliver a lovely, flowering plant, and present a card with your personalized message!